TMP 2 - Introducing Vanduhguyr! And so it is my esteemed pleasure to introduce you to the newest member of my family. Over to you, Van! 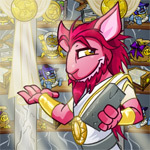 To help you weed out the cruddy items, this article highlights to best prizes from each AC, rather it be for the price, functionality, or nostalgic reasons.